Lately, I’ve been enjoying the World Cup competition in the same way I enjoy the Summer Olympics every four years. These events represent a rare occasion for Americans to gain an appreciation for life outside our borders. I like all the foreign languages, customs, and distinct behavior of the World Cup. I see it as a learning experience. And plus, Futbol (known here in the U.S. as soccer) is easily the most revered sport in the world so I feel a responsibility to appreciate it to some degree. 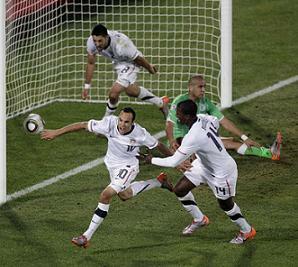 As I was watching a very exciting match-up between the U.S. and Algeria, I had an unexpected science moment. The sides had battled long and hard only to achieve a “nil to nil” tie up until the end of regulation time. This was after the Americans repeatedly “should have” scored with numerous opportunities. On one particular missed opportunity around minute 85, the British announcer proclaimed “in a parallel universe the U.S. just scored, the game is over and they move on to the round of 16.” Imagine that, a current cosmological model working its way into the stage of world sports. As it happened, moments later in minute 91 the U.S. team did score a last minute goal, winning the game, and moving on to the round of 16. So it seems, in this case, the two universes collided! WORLD CUP UPDATE: as I was watching the 3rd place matchup between Germany and Uruguay, the announcers were talking about Uruguay team captain Diego Lugano - "... and in a parallel universe he could have been playing in Wimbledon last week, as he was quite a tennis player ..."
Cool! Another parallel universe in public discourse.